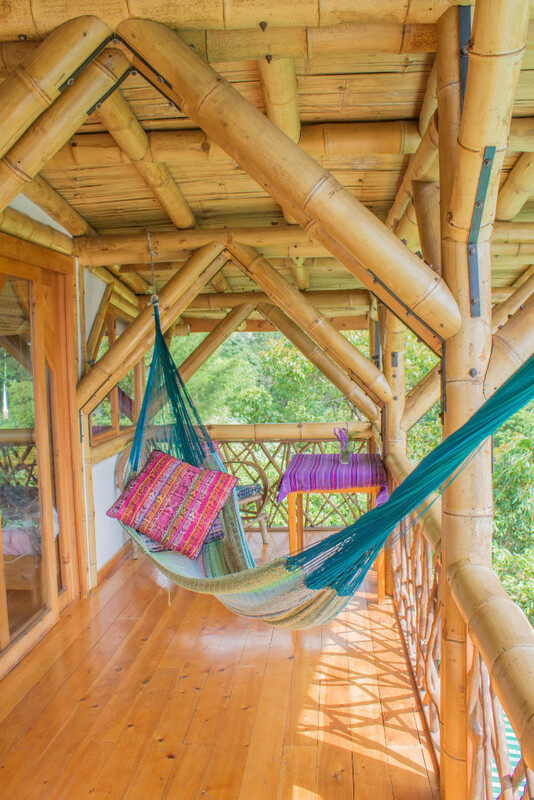 The Bambu Guest House is a stunning naturally-built retreat center for Permaculture and regenerative living on the shores of Lake Atitlan, Guatemala. We specialize in small group travel and retreats with a focus on sustainability and regenerative lifestyles including Permaculture, natural building, yoga, meditation, dance, nutrition, holistic health and much more! Join us as a participant or bring a group to study, learn, empower, and become inspired in the natural beauty of the Mayan Heartland. The Bambu Guest House specialize in hosting groups and retreats that are inspired to learn and practice creative, regenerative living. The Bambu Guest House really feels like a home, where small groups can settle in to learn about each other and all the amazing things happening nearby. Our friendly staff will help you feel comfortable and catered to so that you and your group are free to focus on what matters to you. We're here to help bring your dream to life. We can host up to 24 guests in four large shared rooms, each equipped with a private bathroom, hot water, wifi, and balcony with views of the lake and volcanoes. Working closely with neighboring Permaculture farm Atitlan Organics, the hotel's Farm-to-Table Restaurant features fresh organic food from right next door. We can cater to most any dietary needs and will make sure your group is well nourished. As group leaders ourselves, we know what you're looking for and can provide a level of care you'll be hard pressed to find elsewhere! Our large shared rooms are designed for relaxing and recharging: bright, spacious, and airy, they’re the perfect place to retire after a day of inspiration. 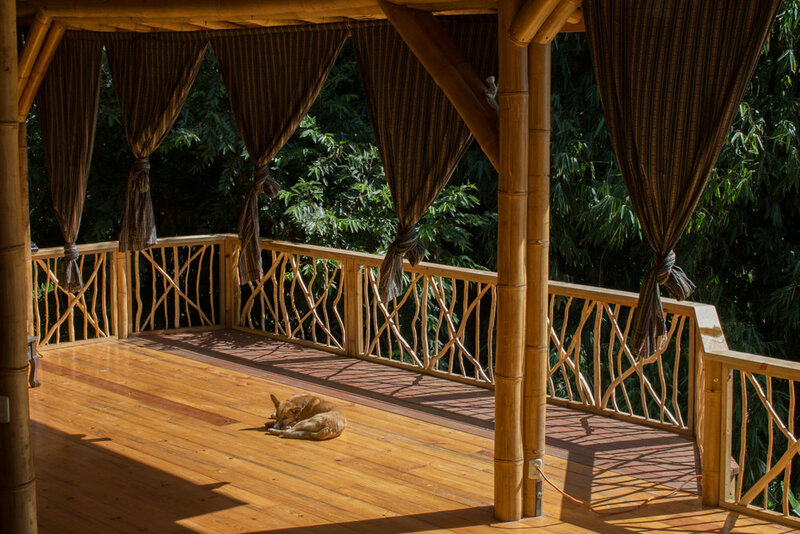 Our commitment to natural building means that each room is constructed from bamboo, wood, stone and glass, seamlessly blending sustainability with luxury. Each room has its own full bathroom with hot water, a balcony with hammock, wifi, comfy beds and amazing views. Hang out on your own balcony and watch the sunset over Lake Atitlan, or enjoy a hot shower and movie in the comfort within. River sounds and bird song are your soundtrack. Our Farm-to-Table Restaurant, supplied by Atitlan Organics Permaculture farm and other local providers, serves up delicious and filling plates. Currently, Atitlan Organics supplies all of the milk, salads, cooking greens, honey, coffee, chicken, taro root, pigeon peas, and herbs to the restaurant. The restaurant is run by three young, local, aspiring chefs named Antonio, Reynaldo, and Rodrigo. They are amazing! Who knew natural could be so beautiful? 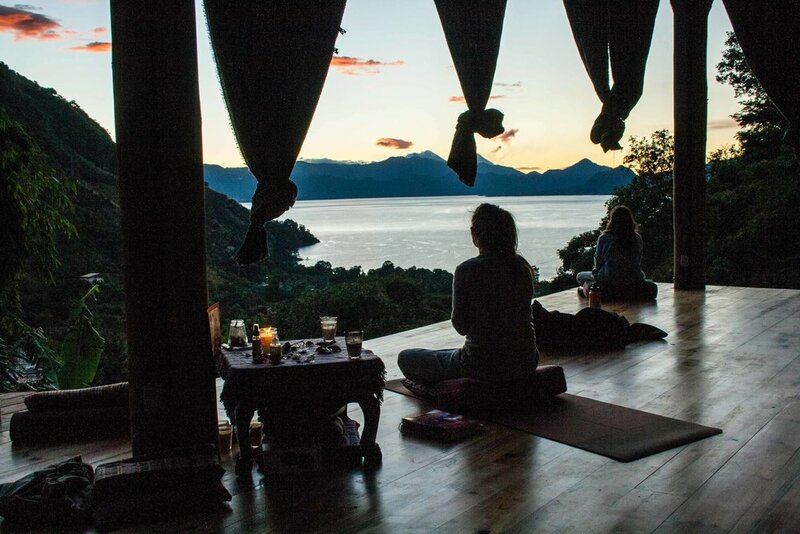 In collaboration with Atitlan Organics and other talented facilitators, we're proud to host courses and retreats focused on sustainable living. 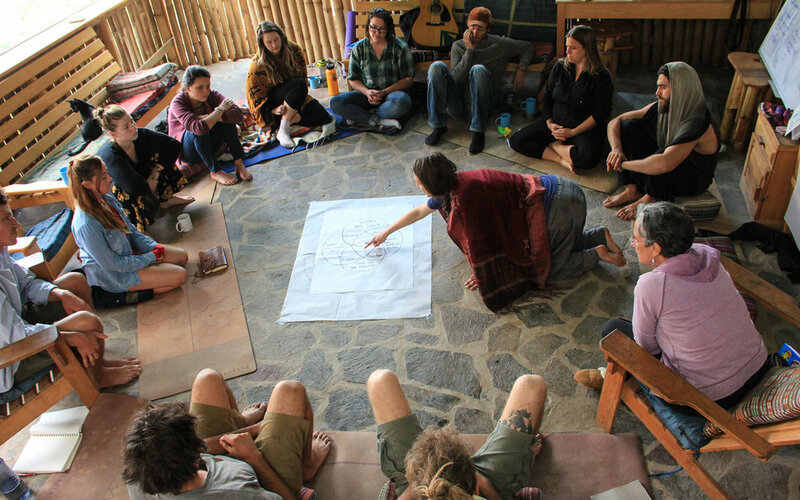 We've always got something interesting and inspiring happening at the Bambu, such as Intro to Permaculture and full Permaculture Design Certification Courses, Natural Building Courses, Yoga retreats and teacher trainings, and more. Check out our full listing of upcoming events below and join us for a transformational experience! Birth is unique, powerful, and transitional. In this course we rediscover birth by diving into the physical, emotional, and spiritual realms of pregnancy, birth, and postpartum. Designed to educate and empower, this course is perfect for birth workers, doulas, prenatal yoga teachers, and mothers and fathers who wish to take charge of their birth experience. This full PDC is in collaboration with The Yoga Forest and includes not only the full 72-hour curriculum but also optional yoga and meditation, allowing participants the space to reflect on Permaculture and their own inner lives. Journey to the Mayan Heartland for a transformational experience with Atitlan Organics and Awakened Spirit Yoga. Highly recommended for yogis, change-makers, innovators, activists, seed planters, or anyone who believes in transformation. This PDC with Atitlan Organics the Mesoamerican Permaculture Institute delves deep into Permaculture with a 90+ hour curriculum covering all aspects of Permaculture ethics, principles, and design, as well as exploring ancestral relationships to the earth and cosmos through indigenous Mayan wisdom and traditions. We offer two distinct workshops areas for your retreat, each with its own unique vibe. Our cozy Living Room space is perfect for group discussions, individual presentations, or lectures. Tables, chairs, couches, and presentation materials are all available. Our newly built Yoga Platform is an amazing space for yoga and other group work. The large deck, locally made bolsters, cushions, and yoga props, and stunning lake views makes it perfect for dynamic group activities. We’ve teamed up with Atitlan Organics to offer this opportunity to groups looking to get involved with the local community, learn about Permaculture and sustainable agriculture, and leave a lasting positive impact which will benefit families and the environment. Designed for groups of 4-18 participants lasting from 3 days to 2 weeks, our customizable program is centered on the preservation of rare, local avocado varieties. Participants will help local farmers to diversify their coffee plots and in doing so promote reforestation, biodiversity, long-term food security, soil and water conservation, erosion control, and local economic development. If you’d like to learn more or bring a group, don’t hesitate to contact us!